The writer’s interest in the Regiment of Canadian Guards began with a peripheral interest in regimental traditions. In 1953, this regiment was drawn from seven Canadian infantry regiments as well as battalions from the Governor General’s Foot Guard and the Canadian Grenadier Guards. It thus absorbed the histories and honours of its component regiments, and adopted the uniforms and traditions of existing guards regiments. The blue forage cap is of particular interest. That for uncommissioned ranks of the British and Canadian foot guards regiments differed from those of other military units in its distinctive style, the use of rank distinctions in the badge and peak trim and its more important role and wider use in the Orders of Dress than the No.1 Dress Cap for other regiments. Officers’ caps differed from other regiments and corps in that there were no rank distinctions. 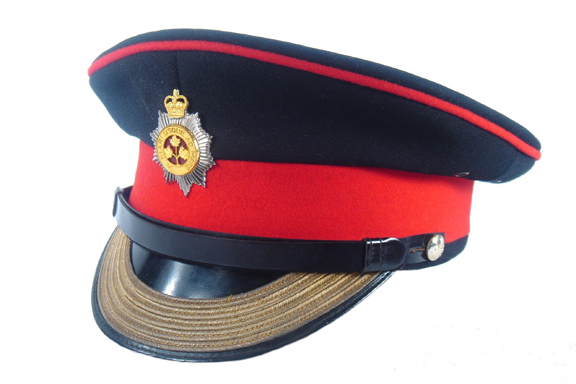 The specifications called for the cap to be the crown and peak military type with chinstrap, scarlet headband and scarlet piping around the crown, the pattern of the British Grenadier Guards. The “guardsman” style called for a more vertical peak, producing a commanding appearance. 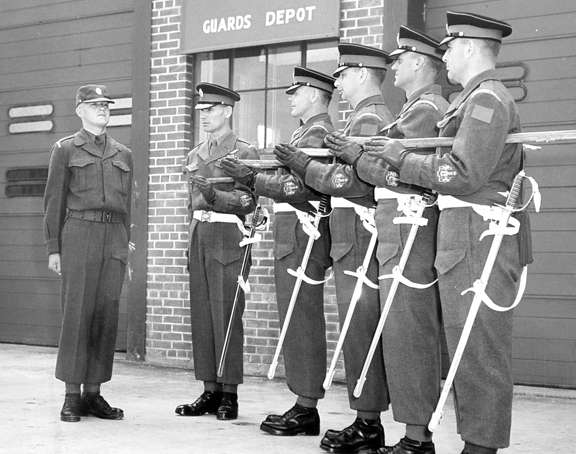 The Canadian Guards’ regulations specified that the original shape of the cap was not to be altered, implying that the peak was not to be “set up”, or made more vertical. No nation has a more comprehensive system of rank designation on the cap than France, where every rank could be read from the cap. Most British and Canadian Foot Guards’ ranks below commissioned officer could be read from the cap peak. The specifications called for the peak to be two and one quarter inches deep at the centre and constructed in three plies. Top ply was black plasticized vinyl chloride, slightly thicker for peaks featuring soutache trim. An inner was ply fibre or pulp board, and the bottom ply “hatters green” diced plate leather. The peaks with brass rank stripes were finished with yellow brass to form a binding 1/4 inch in width on the top and undersurface of the peak. The binding for peaks with soutache rank stripes was black plastic stitched to produce a bound edge 3/16 inch in width. Brass rank stripes were 1/8 inch wide, shaped to the contour of the front edge of the peak, each with three soldered copper pins 1/2 inch in length on the underside. The pins were passed through the top two plies of the peak and clinched before the application of the bottom ply. The first stripe was to be 3/16 inch behind the metal binding and each subsequent stripe 3/16 inch apart. Alternately, the pins could be passed through all three plies and an extra piece of “hatters green” leather applied to the underside of the peak immediately behind the inner edge of the binding. Soutache (Russia) braid was a doubled cord, resembling an electrical wire, made of good quality gold, 1/8 or 3/16 (for band personnel) inch in width, stitched to the upper ply of the peak, the first row placed 1/4 inch above the unfinished front edge and the other rows immediately behind the first row. It is a common practice for the headwear for regimental bands under British influence to differ from the regimental pattern in some way. The regulations called for the cap badge to be mounted centred on the cap so that to top of the cap band bisected the star, but in practice, this varied. Certain rank distinctions within the uncommissioned ranks were also made by the cap badge. The badge was 2 inches high for all ranks. The ten-pointed star was brass, white metal or silver. The annulus containing the regimental motto and three maple leaves was brass or gilt. 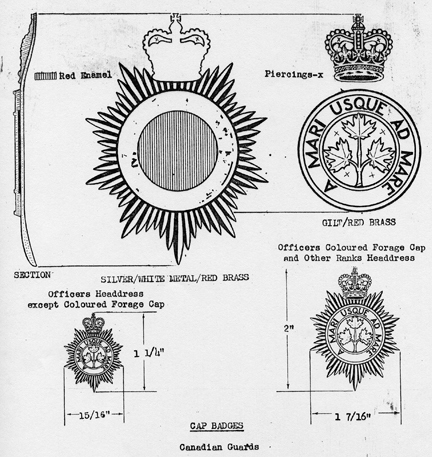 Rank distinctions of the Canadian Guards cap badge. 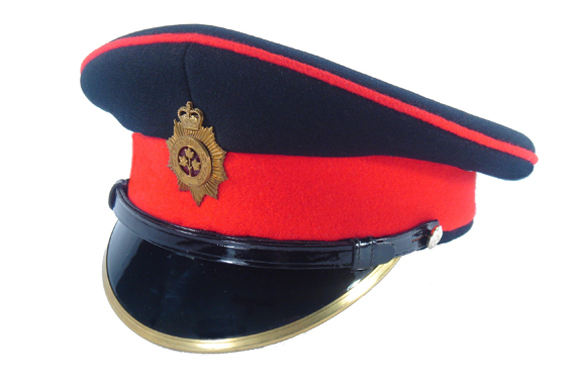 The Guards’ coloured forage cap was worn in a full range of Orders of Dress, in marked contrast to other military units. Patrol Dress – W.O. I and Drill Sergeants, State functions when Full Dress not ordered; church parades; funerals; courts martial; guards of honour; as ordered. Summer Field Dress – all ranks, (blue cap as ordered), summer garrison and training dress. Shirt sleeve order – all ranks, (blue cap as ordered), summer garrison and higher Headquarters buildings. Drill Sergeants were to wear the blue forage cap at all times in barracks and when walking out in uniform. 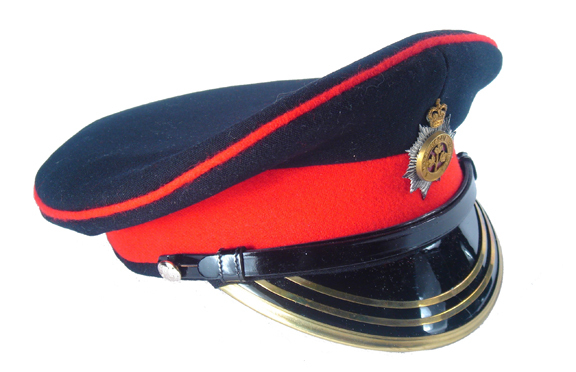 The officers’ forage cap was specified to be the distinctive Coldstream Guards pattern. This was midnight blue cloth with a 1-1/2 inch black mohair band. The peak was finished with 1-1/4 inch wide gold wire bar embroidery. 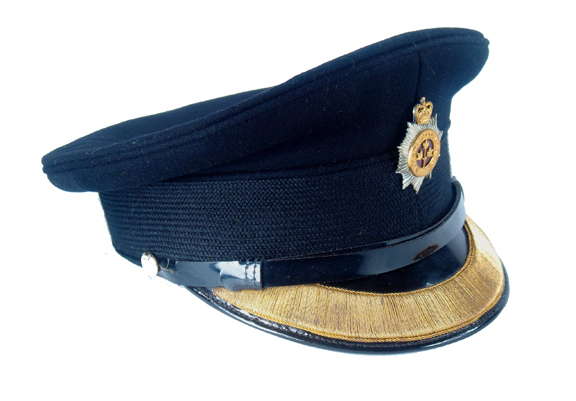 Pattern of Forage Cap common to all Guards Officers. 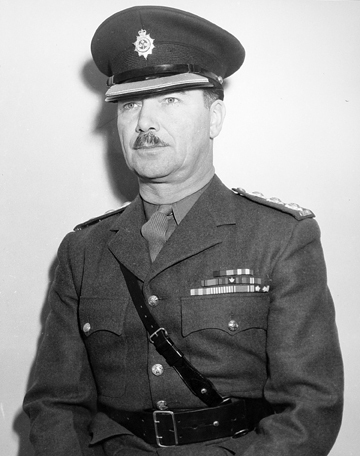 Contrasted to other military regiments and corps, there was no distinction between company and field grade officers, all wearing the same cap peak. 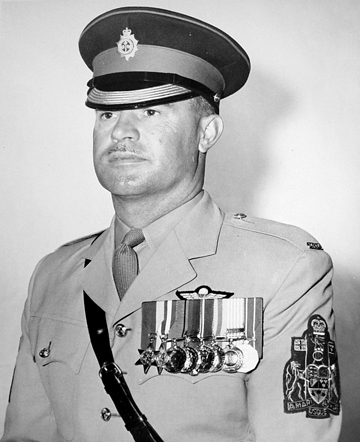 The regulation gilt and silver forage cap badge was worn, while a small version, 1-1/4 inches high, was worn on the khaki Service Dress cap, again a Coldstream Guards tradition. The blue forage cap was to be worn with all six versions of Patrol Dress, both with blue and white uniforms, Mess Dress and Service Dress for unit parades and garrison duties. This article first appeared in Military Collectors’ Club of Canada Journal, volume 242, Fall 2010. Clive, great article. However, some of the photographs in this, and other articles, have collapsed, making them very long and thin. Is there some way of correcting this? I have a Canadian Guards Officer’s cap made by Herbert Johnson of London. It was originally missing its mohair band, but Herbert Johnson was able to replace it for a fiver. The cap badge was also missing but Lou Grimshaw was able to oblige. This may be a browser issue on your end. That said, I am running Firefox so the problem may exist for all IE users. Nonetheless, it doesn’t appear to be anything I can do at this end. Good article. Do you know where a fellow could acquire a corporal’s forage cap for a reasonable price, or in trade for a sergeant’s cap? Clive, my memory of the caps is this: The first OR’s dress forage caps of the Cdn Gds had a soft crown (top). When Strome Galloway’s battalion was posted to Germany he had new forage caps made in the UK which had a stiffer crown. Clive, I am trying to find information of the Full Dress Scarlet Tunics of the Canadian Guards. including pictures if available. Could you point me in the right direction?